I had a CT scan done on last Saturday to check the current condition of my sinusitis -the doctors have changed my health status from Pan sinusitis to Chronic pan sinusitis .This means that damage is extensive and the surgery is inevitable,but at the same time since it involves part of the skull, the consultant doc has told us that it is going to be risky and complicated ,irrespective of whether a machine does it or a surgeon. Now I have to decide what to do - to go for it and risk it or not go for it and let my health deteriorate gradually. Iam on steroids for another thirty days. We are also mulling over the option of going for the Indian system of medicine - Ayurveda. The doc has also suggested the same.Since Allopathy has given us no hope, we'll give it a shot. Thanks everyone for your mails .Apologies for not replying to some of you ,especially Jana and Anita . I am not keen on turning my nice pleasant blog into a chronicle of my health ,but I thought I owe an update to all who visit deepashome regularly. 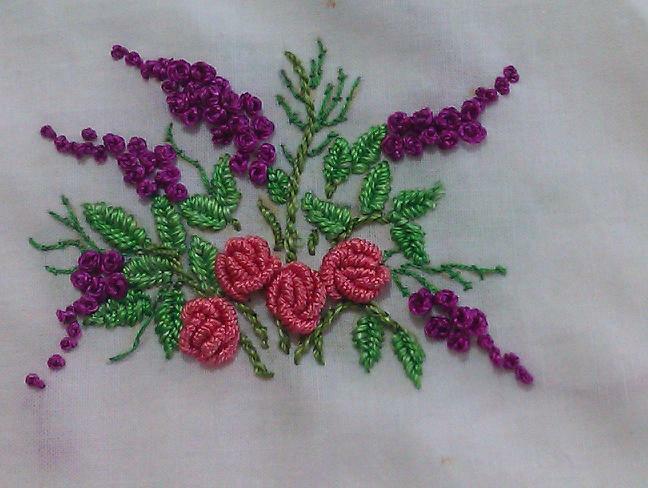 Before I take your leave, I thought I'll share a pic of a brazilian embroidery project which one of my students, Sobha did as part of the online course.I love the way the roses have been stitched and the colors too. I was waiting for an update from you.Wish, everything will be fine regarding your health. Be cheerful always. When we have energy inside, nothing can harm us. Be energetic. The work is too good. Can you please tell me where can I get the BE threads. Dear Deepa, it is lovely to hear from you even though the news is not what we hoped to hear. You are faced with a difficult decision and my thoughts are with you. Sobha's embroidery is beautiful and a credit to you and your class. Thank you for sharing it with us. Many hugs from Chilly Hollow. Good health is so important! Here's to a quick recovery. Really kept wondering how your health has been. Sorry to hear that things haven't gotten any better. We will pray for you, hope ayurveda helps. Take care. Take care Deepa....wishing you a very speedy recovery. Get well soon!!!! Deepa... all day yesterday I was thinking of you, I must have known you were going to make a post... I was worried because we had not heard from you in a while... I should have emailed you, but I hate to "bother" people and I knew you would let us know what was up sooner or later... I am sorry to hear of your plight and I wish you all the best and am sending positive thoughts your way... we have not forgotten you. Thanks for sharing the BE... lovely. Hugs. Hey deepa wish u a fast recovery. I have started following ur blog only a week ago, and its already inspiring me in my work. I´ll be waiting you back and 100% better .... I know is not easy this kind of surgery .... But I´ll be here keep think positive for you and your doctor ... everything is gone be all right!! Great stitcher student you have!! I am sorry, Deepa, to read that things have not improved with your sinusitis, but pray that Ayurveda medicine will provide a cure. Your student's work is very impressive and beautiful. Dear Deepa,be positive and cheerful always.everything will be fine.my thoughts and prayers are with you forever. Thanks for the update, I didn't dare to write again and bother you. I am glad to see that you are in a good mood, in spite of. Thinking of you, and hoping for the best. I'll be thinking about you Deepa and hoping for a quick recovery for you. Wish you a speedy recovery... get well soon. I was thinking about your health.Wish u a speed recovery. thanks for the update. happy to hear you're in a good mood and doing some stitching. hoping aryuveda works for you.